← Congratulations Week 07-27-15 & 08-03-15 #Giveaway #Winners! 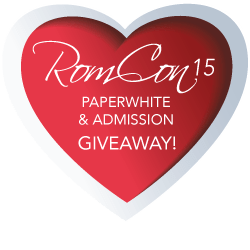 #WIN Kindle Paperwhite & Saturday Admission to #RomCon2015 Reader Weekend!! #WIN Kindle Paperwhite & Saturday Admission to #RomCon2015 Reader Weekend in Denver, Colorado!! Join Bestselling Contemporary Romance Author Karen Docter at #RomCon2015 when she, along with 60+ fabulous romance authors, host this annual READERS CONFERENCE. Get one-on-one with your favorite authors in Intimate Chats. Play games. Attend the book signing. Put on your favorite cowboy hat and join us for Western Cowboy Night, too. There will be lots of swag…and so much more! Enter the Rafflecopter below for a chance to win the Paperwhite and Saturday Admission. Want a 1 in 7 chance to win a Kindle Fire 7 HD, too? All you have to do is sign up to sit at my Luncheon Table on Saturday, September 26th. Win your admission through the Rafflecopter below OR purchase a $99 ticket for the full day, or even better, join us for the entire weekend. I’d love to meet you! I’ll have goodies for everyone at my table and one of people who sits at my table will win the Kindle Fire 7 HD. I’ll be signing Satin Pleasures and Cop On Her Doorstep at the autographing. If you already have the books, bring them with you so I can autograph them for you. If your book is digital, I’ll have trading cards to sign, too. S.W.A.T. 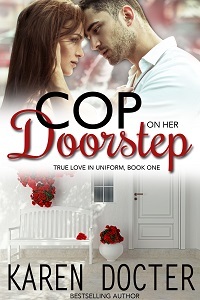 officer Jake Stafani already lost one little boy to gang violence, the dead boy’s older brother is missing, and Jake’s not about to let the same thing happen to a neighbor’s son. He drags the youngster home only to discover much more than a passing interest in the boy’s beautiful, but wary, mother. Forced to take a leave of absence after a bust goes awry, Jake can think of nothing better to occupy his time than to keep Carrie and her son safe, and locate the missing teen who holds the key to taking the gang off the streets, once and for all. Can’t wait to meet you. Happy Reading! This entry was posted in Announcement, Blog Hop: RomCon Promotions, Karen's Killer BOOK BENCH, Specials & Giveaways. Bookmark the permalink. 5 Responses to #WIN Kindle Paperwhite & Saturday Admission to #RomCon2015 Reader Weekend!! That’s awesome Gl to everyone who is able to go and enter! Awesome giveaway Karen Thank you for your generosity! I love to meet my readers and RomCon is the one event I go to each year. We have so much fun hanging together and sharing our love for romance. I would love to go and sit at your table, what an awesome experience. Thank you for the opportunity. It will be an awesome experience even if you sit at one of the other author tables. 🙂 It promises to be oodles of fun, Linda. Good luck!